Cheshire Cat Photo Blog (… said the Cat: 'we're all mad here….') » Blog Archive » “The Golf Course Bandit” is a fox, indeed! A series of encounters similar to this have occurred at the Tony Lema Golf Course at Monarch Bay in San Leandro. Lucke said he returned with his pocket camera to the course. Again, the fox sneaked up on him and staked out his golf court, apparently waiting for it to be left unattended, when the fox could then nab anything available. Instead, Lucke took an amazing series of photographs in which the fox looks something like a character out of a cartoon. The last five incidents include cell phones, a whiskey flask, a wallet and car keys. In the last case, the golfer chased the bandit fox into adjoining wetlands, where it dropped the wallet but not the keys, Clore <Herb Clore, president of the San Leandro Golf Club> said. Golf courses have provided rich habitats for prey species during the California drought. The courses have water, abundant grass, and plenty of people, who discourage the presence of major predators! Many golf courses have become home for small but healthy resident deer herds that have learned to never stray far from the course. 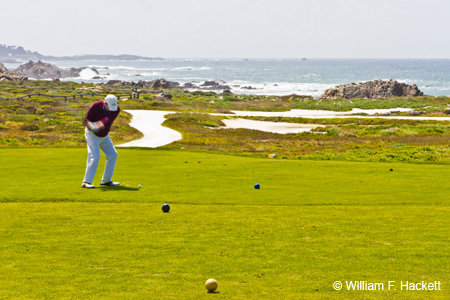 Foxes, too, seem to thrive at golf courses, including those on the San Francisco coast. Golfers have sighted pheasants at Harding Park. Courses with large ponds have been ideal for migratory waterfowl and songbirds, especially resident Canada geese. "“The Golf Course Bandit” is a fox, indeed!" was written on December 27th, 2015 by Bill, and filed under California,Uncategorized. Previous: Karma: Act II, Scene 1- Martin Shkreli’s former company IMPLODES!